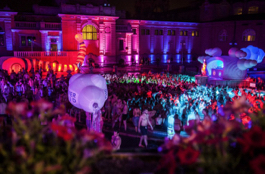 Szechenyi Baths is not only the biggest thermal spa baths in Budapest but is also the largest European medicinal baths indeed a huge bath complex with 18 various pools, sauna rooms, massage therapies, fitness centre, a beautiful reception room, etc. No wonder, tourists who first visit our world famous spa baths feel at a loss. 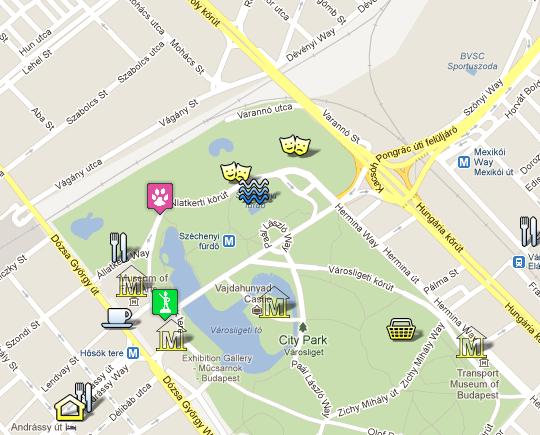 See where Szechenyi Baths is located in Budapest at the bottom, on Budapest tourist map. We are sharing with you 2 downloadable maps for Szechenyi Baths, one with Celsius and the other with Fahrenheit. Here is the Szechenyi Spa Baths Map with pool-bath-sauna temperature degrees shown in Fahrenheit (download as Szechenyi Baths & Pool Fahrenheit pdf – please see the image on the right). So these are our printable Szechenyi Baths and Pool Maps with the outdoor and indoor pools, saunas, massage therapies, etc. to help you find your way around the big area of Szechenyi Spa Baths, with its often confusing corridors, rooms, pools and chambers. You can click on the map to see the original larger map and can print it for future use (warmly recommended as there are no printed maps on offer at the Szechenyi Baths). We often hear complaints from tourists that the wall boards and notices are not informative enough. Now here is a comfortable pocket map for Szechenyi Baths! Hopefully, it will help you not to get lost or feel frustrated when communicating with the bath staff is not smooth enough. We regret to admit that not everyone in the personnel of the thermal baths speaks advanced English, therefore, some tourists feel an English map for navigating within the spa bath complex of Szechenyi Furdo would be helpful. We are presenting 2 printable maps for you below, and also an interactive map (with even more info) at the bottom. 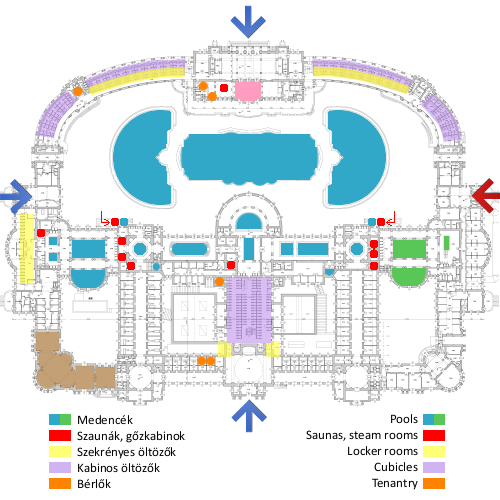 You can click on the map to see the original larger map and can print it for future use (warmly recommended as there are no printed maps on offer on the premises of Szechenyi Baths). We often hear complaints from tourists that the wall boards and notices are not informative enough. 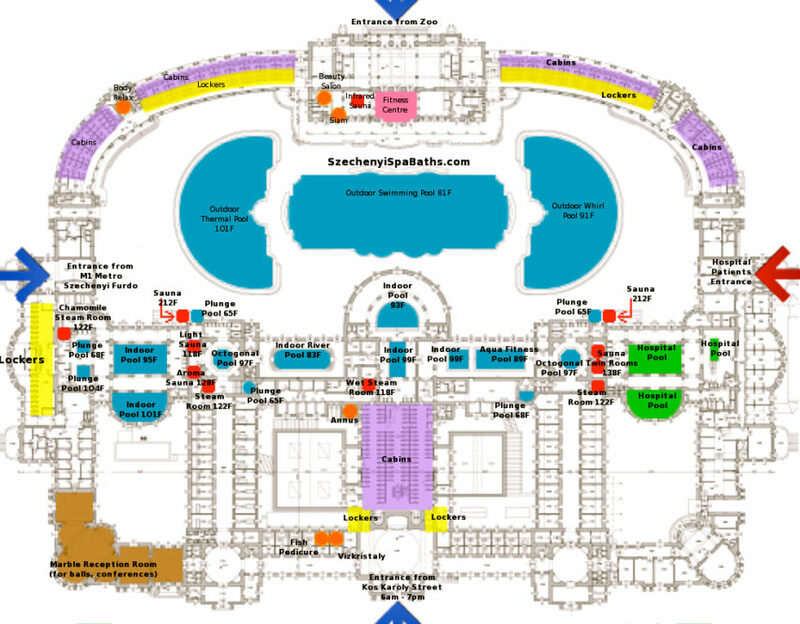 Now here is a comfortable pocket map for Szechenyi Baths from SzechenyiSpaBaths.com. Hopefully, it will help you not to get lost, or feel frustrated when (mis)communicating with the bath staff. 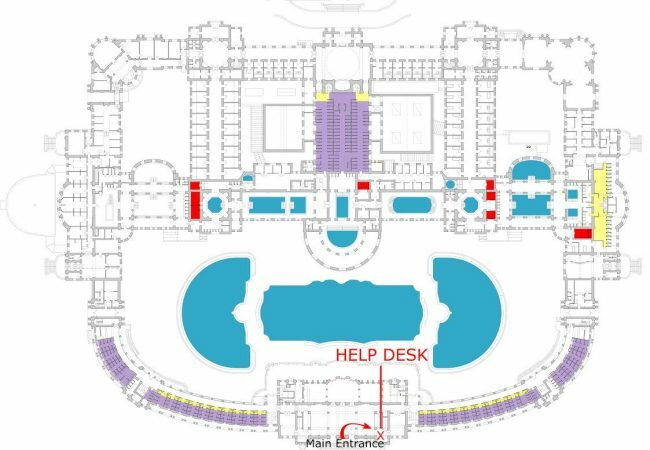 The Help Desk is located at the main entrance, opposite the Budapest Circus building. If you have online purchased tickets, please do NOT join the queues at the cashiers as they will redirect you to the Help Desk. 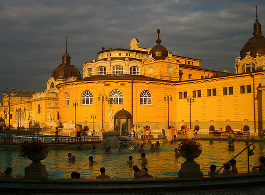 Finally, here is the interactive online map of Szechenyi Spa Baths and Pools. Red: saunas and steam rooms. The interactive indoor map of Szechenyi Spa Baths: hover your mouse over the section you wish to see. Please note that Szechenyi Spa Baths have certain sections that are only available for Hospital patients (locals being treated with aqua therapy). 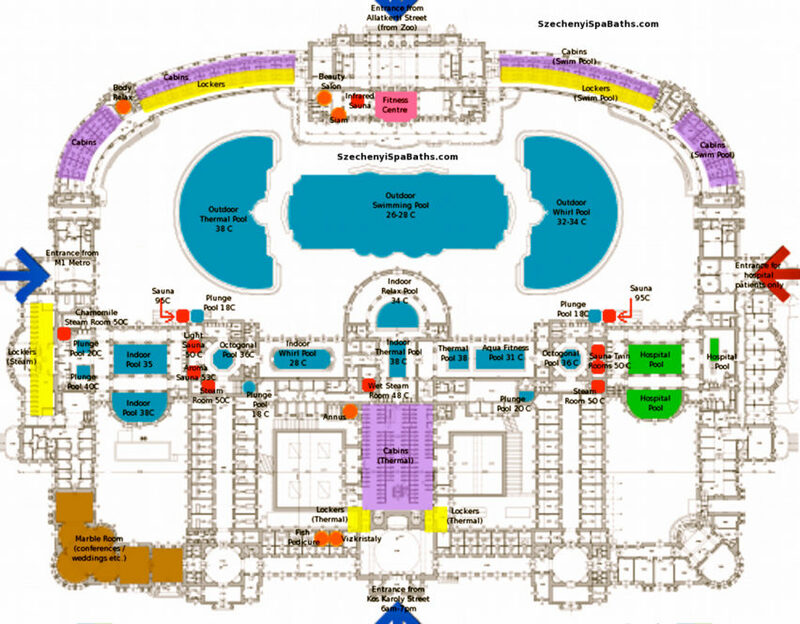 As you can see, the bath complex is huge, but symmetrical. Hi 2 questions, we are student do u have student discount ? Secondly we would like to book for our trip on Friday but there isn’t any available for 16th online. Would it be any chance to book for bath and thermal massages for two person? There are no student discounts in Szechenyi Baths, I am afraid. Currently, booking is only possible until 4 January, 2019. Please get back to us at the end of this year for the new prices and booking. 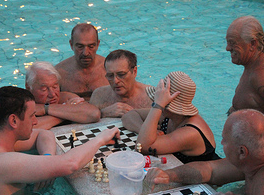 Hi, when do sparties move from the large outdoor pool to the smaller Lukacs pool for winter? 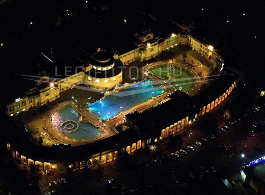 The spa parties will be held in Szechenyi Baths during the winter months, they will not move to Lukacs Spa. 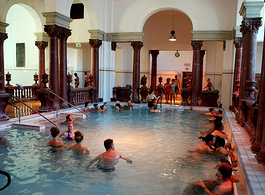 guests with mobility problems are welcomed, the baths is suitable for them as well. Would be allowed to bath with a child of 2 years and an half? We are 2 adults and our child. If so, should we buy a regular ticket for him? On the online Booking section i saw that on the 26th December the bath will be at its full capacity. What does this mean? Will i be able to enter the bath anyway? it means that we are expecting a lot of guests and it can happen that we will not be able to let everyone in. That case we can let guests in when someone has left the baths and the waiting time will be increased. I’m planning to visit Budapest on 22-26 of January. I’ve tried to book tickets for the szechenyi baths for 24 or 25 but i can’t pick the dates on the online ticketing. Is that mean that is fully booked?